Back To Eden Gardening in a Honeycomb Gardenbox. Last year I made a couple of raised beds in our community garden 'Sweetgrass in de Polder'. To make them more playful I decided to make them in the shape of a Hexagon (read also: Composting Worms in a DIY Honeycomb Gardenbox). The gardens became very beautiful and the plants grew well. Some of the gardens were given to children in the neighbourhood and they enjoyed growing their own veggies. Unwanted plants in the gardenbox. To prevent roots from the trees and other plants to grow into the garden beds I had covered the bottom and sides with one big piece of anti-root cloth before filling them with soil. But the many seeds that fly and fall into the garden still resulted in having to take out many weeds, or choose to let the gardens turn into hexagon lawns. I love working in the garden, but I don't like weeding. And in a garden so full of grass and wild flowers there will be many to deal with. Taking out plants with root and all disturbs the soil and this is something I rather would not do. It's much better to leave the plants and let the soil life do its thing. Plants and micro-organisms build a complex network to benefit each other and taking out plants disturbs this process. Another issue was the watering of the plants. In the warmer periods the garden boxes still needed to be watered. This also takes a lot of time and energy and the children would often forget to do theirs, resulting in double work for us adults. So what could be a solution? Some time ago I came across the concept of Back To Eden Gardening. The technique is fairly simple: keep the soil covered... all the time! (And pray a lot ;) ) You can use different sources for ground cover but the one mostly used is wood chips. At first I was surprised since I was always taught that for veggies to grow well you better dont use wood chips as a mulch. But it seems that people using the Back To Eden Gardening method have great results and with a lot less work! So today, after taking out the weeds and grass ((hopefully for the last time) from the raised garden beds I decided to give the method a try. Weeds and roots removed. Compost added to the soil. I had just emptied my own Worm Hotel and had a wheelbarrow full of fresh compost full of composting worms and baby worms. The tubes in the centre of the Hexagon gardens were a bit empty and so I decided to fill those with this fresh vermicompost. The worms would not be happy with the bare top layer of the garden so I had to cover the soil with something. And so the idea for the BTEG-method came back to mind. The wood chips will decompose over time and will add to the structure of the soil in the garden beds. But mostly they will help now to keep the moist in the soil and the weeds out! The worms love to hang out under a layer of wood chips and there they will help improve the soil in the garden beds. to move in and out of the tube into the raised garden bed. When I will plant my seedlings in the garden all I have to do is move some wood chips to the side and plant directly in the layer under the wood chips. Then the wood chips are moved back around the little plant. Using perennial plants instead of annuals will also help to build a good soil-food-web and keep unwanted plants out. Many of the plants that come unwanted are pioneer plants; plants that come when the soil is disturbed. So weeding and turning the soil will automatically create great opportunity for the weeds to grow. Better to leave the soil unturned and covered. Let's get some plants in here! 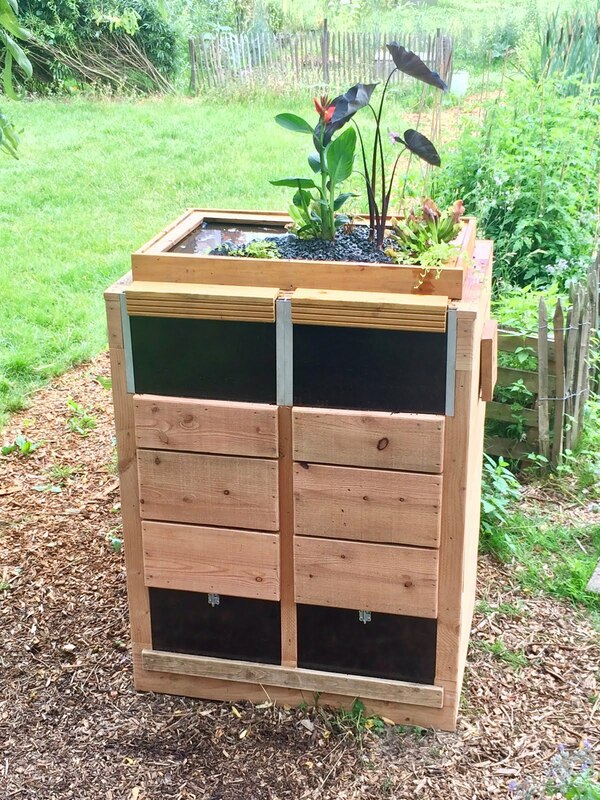 Build a DIY Honeycomb Garden box for your own garden. Building these fun hexagon shaped garden beds is not difficult at all. All you need is some simple hand tools and the proper wood. 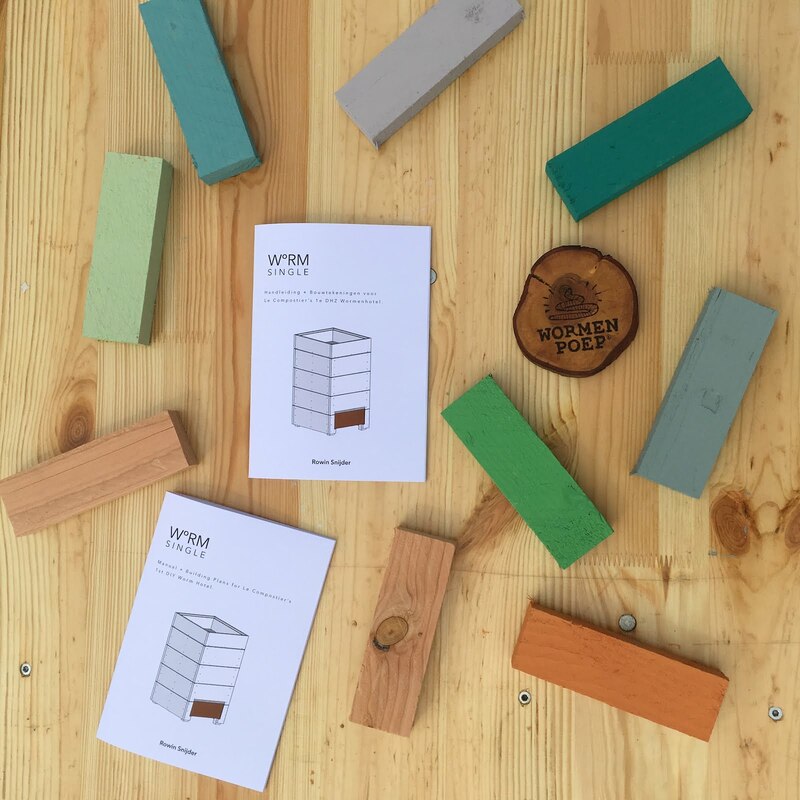 In this blogpost you can read how to make your DIY Honeycomb Garden box. Good luck! And if you enjoyed reading this blogpost, please feel free to leave a comment under here! Thank you. More fun DIY blogposts from Le Compostier are found here!